Register your wedding with us below. The information will be passed on to the Suspended In Time® dealer nearest you. This dealer will contact you to arrange the perfect encasement choice for your wedding bouquet preservation. 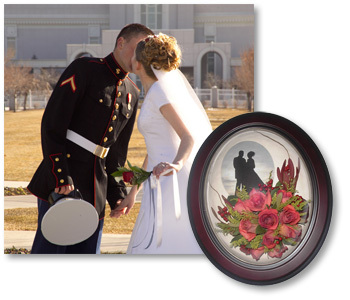 Any guest may then purchase the floral preservation for you as a wedding gift. There is no obligation with this registration. To purchase a gift certificate from your local dealer fill out the form below. You will not be charged for the gift certificate until you speak with your local dealer. You will be contacted within 3 business days. Or, contact your local dealer directly. © 2019. Suspended In Time®, Inc. All Rights Reserved.